​With the season approaching its end, eyes are already beginning to turn towards the opening of the summer transfer window, where all the real fun begins. Whether it's Peter Odemwingie being left high and dry searching for a desperate move on deadline day, or the age-old Arsene Wenger line of 'I almost signed (insert name here)', the whirlwind world of transfers are what football fans live and die for. As such, here is a look at the latest transfer rumours doing the rounds on Friday. With the Cottagers' relegation back to the ​Championship confirmed earlier this week, Fulham's post-season plans are beginning to take shape already. According to ​The Sun, Andre Schurrle will become the first name on the chopping block, with ​Fulham inserting a clause in the German's two-year loan deal that would allow them to send the winger back to Borussia Dortmund. Schurrle is likely to be the first of many first-team stars at Craven Cottage forced out, with recent reports also suggesting Ryan Sessegnon and Aleksandar Mitrovic could be allowed to move on, with London rivals ​Tottenham mooted as a possible destination for the pair. After Alisson's move to Liverpool last summer, Roma turned towards Swedish international Robin Olsen as his replacement. However, with things not seemingly working out at the Stadio Olimpico, ​Calciomercato claim that the Giallorossi are keen on cutting their losses on the goalkeeper. ​They reveal that both ​Bournemouth and ​Norwich are 'trying' for the 29-year-old ahead of a potential summer move, and that Roma would be willing to sanction a deal less than the €15m they initially paid for him. The Swede has kept just four clean sheets all season this year, and conceded 42 goals in 27 games. It appears his time in Italy may be over already. Football Insider claims the Gunners are very keen on Everton centre-back Michael Keane, and that manager Unai Emery is said to be a 'big admirer' of the England international. But with only £40m to £50m available in the transfer budget according to most people, ​Keane's pricey valuation may just see the Gunners steer clear. The defender still has three years left on his contract, and the ball is very much in Everton's court in any potential deal. One of the undoubted signings of the season, it is fair to say Felipe Anderson's first campaign at the club has and well truly banished those painful memories of Dimitri 'Snake in the Grass' Payet. The former Lazio man has been in sparkling form at the London Stadium, but according to ​Bleacher Report, the Anderson-West Ham love story may come to an abrupt end. 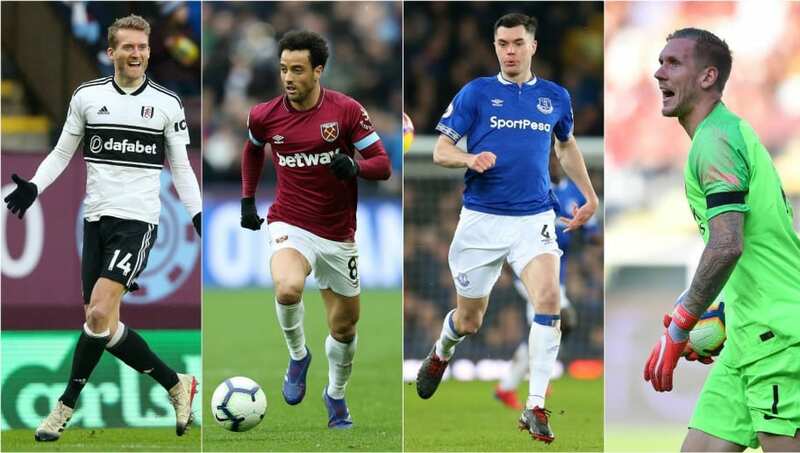 It claims that Hammers owner David Sullivan has told the Brazilian he will be allowed to leave the club if one of the Premier League's 'big six' come in for him this summer. Manuel Pellegrini's side are keen on tying Anderson down to a new contract, but are aware that his head could be turned by a move from one of the Champions League chasing sides. The bright side for ​West Ham fans? It'd cost more than £75m for him to leave. Just what on earth happened with Zeljko Buvac? Part of an impressive tandem with Jurgen Klopp right from the very beginning, Buvac left Anfield just days before the Reds' Champions League semi-final second leg against Roma last May. Out of work since, ​Sky Sports now report Klopp's former right-hand man is a leading candidate for the manager's job at Schalke. The ​Bundesliga side are on the look-out for a permanent manager to replace interim boss Huub Stevens, with suggestions that Buvac and the club are already involved in negotiations. Ex-Huddersfield boss David Wagner was rumoured to be in the running to take over, but it appears Buvac will now make his long-awaited return to football. And finally, one of the brightest young prospects in English football, and linked with both Manchester United and Liverpool, Romello Mitchell is seemingly on his way to ​Southampton. The 16-year-old has earned rave reviews whilst playing for Birmingham's academy sides, and is now set for a quick step-up in quality with a move to the Premier League. As per ​The Times' Paul Joyce, the Saints will pay Birmingham £300k, with the deal potentially reaching £1m depending on clauses met. But as we all know, Mitchell will probably end up at Anfield sooner rather than later judging by how things typically go.